May 24th is National Tiara Day. Andy Thomas, Pilgrims PCUSA Young Adult Volunteer at the time, came into my office late in the day on May 24th, a bit peeved that he just found out it was National Tiara Day. Andy quickly put this day in his 2017 calendar. He sent me a Snapchat to me later on in the evening showing he had properly celebrated National Tiara Day. I mentioned this to Pilgrim Leisha Reynolds who immediately started strategizing---on Andy's last Sunday at Pilgrims we will wear tiaras in his honor, keeping the tiaras a secret from Andy. Leisha fired-up Amazon Prime and ordered 50 or so tiaras. July 31st became "Tiara Sunday" at Pilgrims. During our final hymn we were still gathered around the communion table for our prayers of the people and two of our Pilgrim kids handed out the tiaras. While one Pilgrim kid was handing out the tiaras, he turned to another Pilgrim and said, "don't ask any questions, I don't know what's happening, just put on the tiara." Then Pilgrim kid looked at Andy and said, "you had something to do with this, didn't you." By the time the hymn ended, we were all wearing tiaras. We gathered around Andy, and Rachel Ford, our summer intern, who was also having her last Sunday, laid hands on them and prayed them off into the world. Rachel, a now last year student at Vanderbilt Divinity, wrote several "case studies" during her internship. Rachel's last case study focused on "Tiara Sunday" at Pilgrims. Looking around the sanctuary, it was impossible to miss all the men in tiaras. Women were wearing tiaras but it was the men in pink and purple tiaras that prompted this reflection. What a bold subversion of traditional understandings of masculinity! Men wearing tiaras and being vulnerable in a community, all while crowded around a young, sobbing, openly gay religious leader. There were older men in the congregation who had been members for 30+ years who weren’t afraid to show solidarity with Andy, even if it meant donning a tiara for a prayer. There was no hesitation; they didn’t even think twice. It has caused me to pause and reflect on how those men got to this point. Where did they learn about masculinity, and how did they come to move beyond societal expectations? Who were the role models that paved the way for them? I was also touched by the Pilgrim kids statements (just put on the tiara!) and the presence of all the children in the service. The older members of the congregation are creating a safe space for those kids to learn and grow. They are the role models, and those kids will grow up better for knowing them. Although not always the easier path, those kids will grow up more open and socially conscious than many of their peers because of their involvement at Pilgrims. The passing down of love and awareness from one generation to the next gives me hope for the world. May liturgy be an experience of the passing down of love and awareness from one generation to the next. 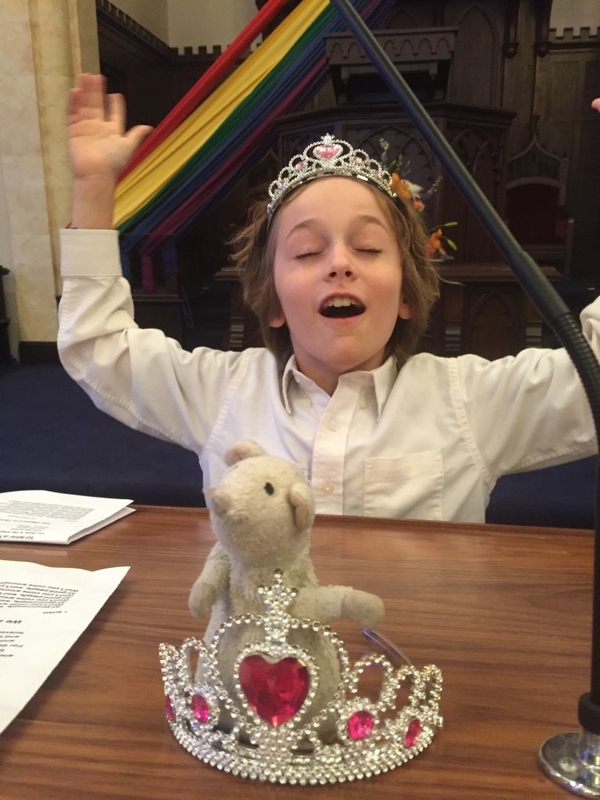 Young Pilgrim celebrates Tiara Sunday by placing a tiara around his favorite "lovie".